Let’s face it. These days customers will either brag about you or they’ll sink you. Learn how you can accelerate positive word-of-mouth with broad social media as well as targeted personalized follow-ups to build a company your customers will be proud of. Learn specific examples of how Blinds.com through its call center, operations, internal communication, and training engenders loyalty from its employees and customers, then encourages both to spread the word. Apply these strategies to yield higher conversion rates and lower advertising costs, resulting in higher profits no matter how the economy is doing. 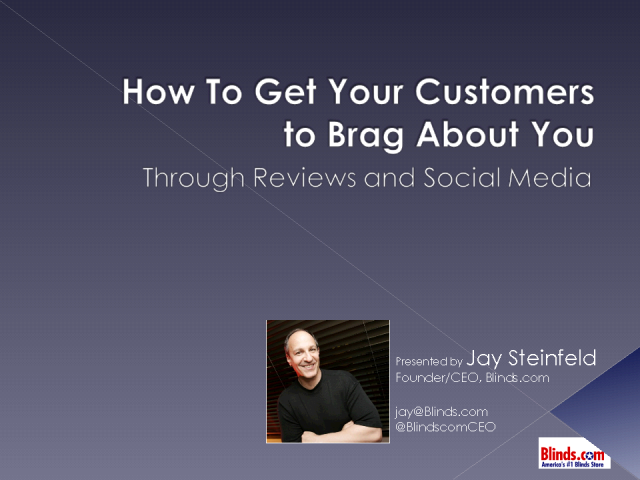 Jay Steinfeld is the company’s founder and CEO, bootstrapping it initially from his garage to now the most successful online retailer of blinds in the world.